Moscow will not let this new round of sanctions by Canada go unanswered. 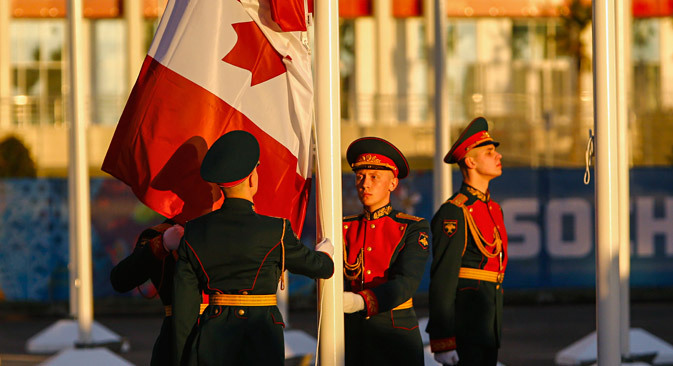 Alexander Lukashevich, a Russian Foreign Ministry spokesman, said on June 30 that the new sanctions would only serve to increase acrimony in the Russian-Canadian relationship. “No doubt, this move won't be left without a response,” Lukashevich said. “One can only regret such unfriendly actions by Canada." The purpose of the Western sanctions policy is to unleash a “Cold War,” Alexei Pushkov, the Russian State Duma International Affairs Committee Chairman. "The sanctions policy is playing into the hands of political forces that exist overseas and on the European continent that want to thrust another Cold War on Europe," Pushkov said at a State Duma meeting on June 30, speaking on behalf of the United Russia faction. He added that Russia should choose specific targets for applying countermeasures. Pushkov reminded the audience that Canada decided to broaden the sanctions on June 29 by adding a number of large Russian enterprises to the list, in addition to three persons, who "had nothing to do with the mechanism of making political decisions in Russia." He was referring to Russian political analyst Alexander Dugin and leaders of the Eurasian Youth Union Pavel Kanitschev and Andrey Kovalenko who were placed on the list. The Canadian Foreign Ministry released a statement on Monday, June 29, announcing that major Russian oil companies Gazprom, Gazprom Neft, Surgutneftegaz and Transneft had been included on its extended sanction list. Sanctions are also being imposed against Russian companies Oboronprom, Chemcomposite, Stankoinstrument, Vysokotochnye Kompleksy, United Aircraft Corporation, Tula Arms Plant and Sirius. Additionally, the sanctions will affect Marshall Capital Fund, the Eurasian Youth Union and Night Wolves Motorcycle Club. Canada’s sanction list already contains over 200 Russian companies and organizations along with individuals, including several citizens of Ukraine. The Russian Embassy in Ottawa stated that Canada is undermining cooperation by broadening sanctions against Russia, urging the country to return to a path of pragmatism. Kirill Kalinin, the press secretary of the Russian Embassy in Canada, was quoted as saying that the new round of sanctions would harm important bilateral cooperation between the two countries in the Arctic, in the fight against international terrorism and in the business arena.